This is officially my very first cream/gel *I don't really know the different >_< * eyeliner! I like to wear liquid eyeliner rather than gel/pencil, because I think the color is more bright and easy to use *for me*. Earlier this month, I saw a local online shop had a great deal for thiseyeliner. The price for this eyeliner is $3 (ELF Official Website) but when it comes to Indonesia, the price usually at range IDR 55K-90K and I got mine for IDR 35K! cheap price, right? Copper, Gunmetal, Metallic Olive, Teal Tease, Plum Purple, Coffee, Black, Midnight, Ivory, Golden, Punk Purple. Packaging: This eyeliner comes with a small glass pot (which I think really cute). It also comes with a little brush. The packaging isn't air tight! *I hate this the most because it will makes the eyeliner dries faster*. The brush is quite soft but it doesn't comes with any cover or brush guard. 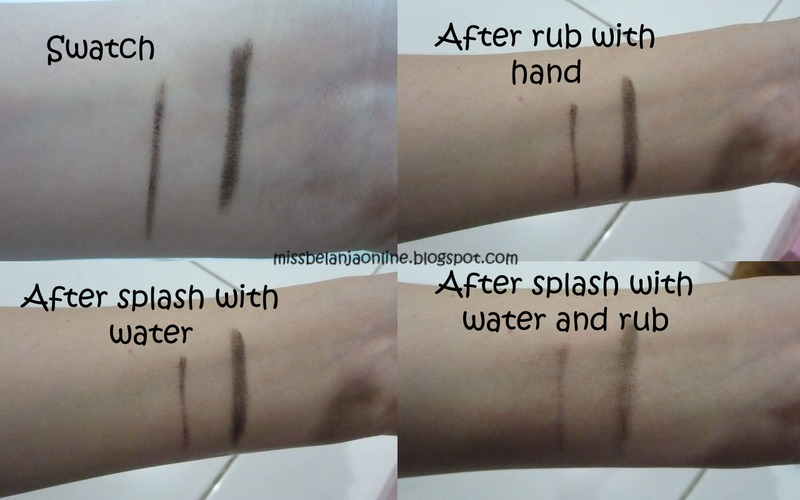 Quite Waterproof and smudgeproof~ unless you rub it very hard. The staying power is awesome! 35rb ce? kok muraaah .__. Hi chin chin, no it doesn't smear or transfer. gr2 baca2 review km sha aku jd trtarik jg sm elf tp yg br kucoba blushnya doank sih.. oh klo utk produk eyesnya agak mengecewakan yaa? memang lmyan murah sih ya jd pengaruh jg kali k kualitasnya, scara dgn harga sgitu ud dpt brushnya jg ._. wrnanya agak k khaki gt yaa? eye lid aku tuh suka oily bgt ci, kalo pake ini bisa smudge g y kira-kira?